As explored in Figure 1 above, transformative BIM adoption starts at the Point of Adoption (PoA) when an organization, after a period of planning and preparation (readiness), successfully adopts object-based modelling tools and workflows. The PoA thus marks the initial capability jump from no BIM abilities (pre-BIM status) to minimum BIM capability (Stage 1). As the adopter interacts with other adopters, a second capability jump (Stage 2) marks the organization’s ability to successfully engage in model-based collaboration. Also, as the organisation starts to engage with multiple stakeholders across the supply chain, a third capability jump (Stage 3) is necessary to benefit from integrated, network-based tools, processes and protocols (refer back to BIM Stages). Each of these capability jumps is preceded with considerable investment in human and physical resources, and each stage signals new organizational abilities and deliverables not available before the jump. However, the deliverables of different organizations at the same stage may vary in quality, repeatability and predictability (refer to BIM Maturity Index). 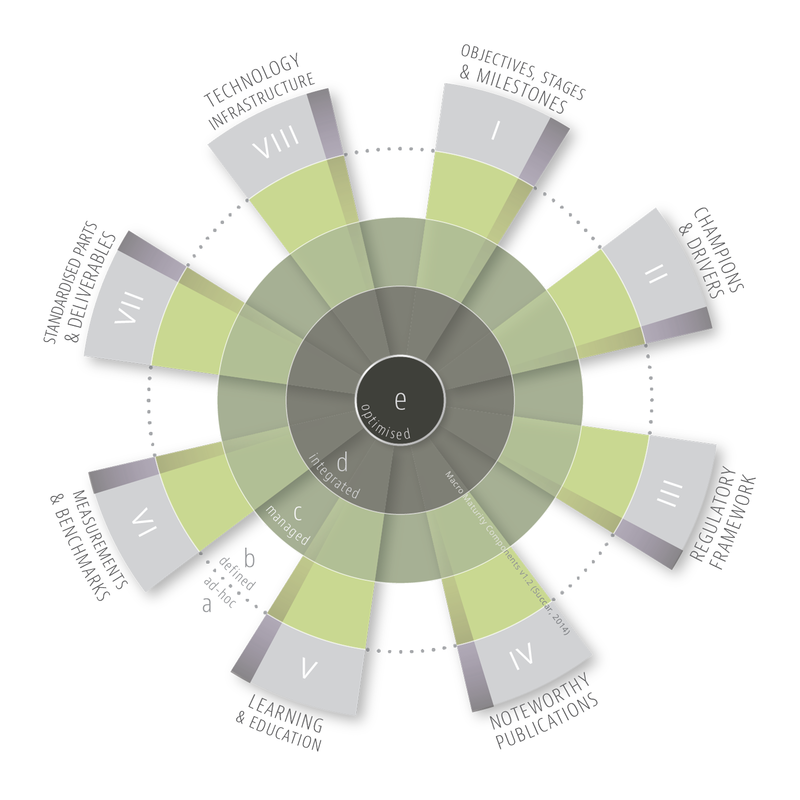 This variance in performance excellence occurs as organizations climb their respective BIM maturity curve, experience their internal BIM diffusion, and gradually improve their performance over time. 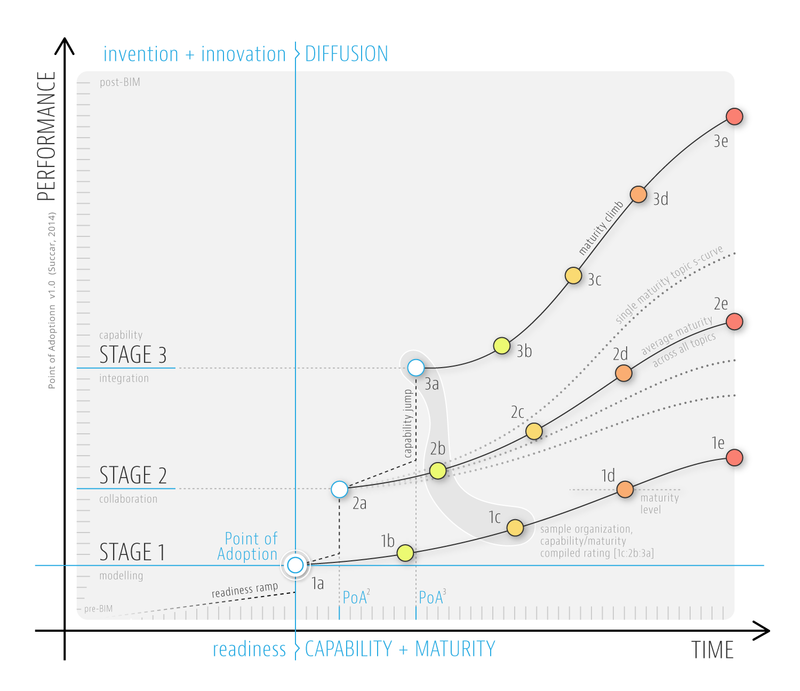 The multiple maturity curves depicted in Figure 1 reflect the heterogeneous nature of BIM adoption even within the same organization (e.g. sample Organization X) has a compiled rating of 1c, 2b and 3a). This is due to the phased nature of BIM with each revolutionary stage requiring its own readiness ramp, capability jump, maturity climb, and point of adoption. This is also due to varied abilities across organizational sub-units and project teams: while organizational unit A1 (within Organization A) may have elevated model-based collaboration capabilities, unit A2 may have basic modelling capabilities, and unit A3 may still be preparing to implement BIM software tools. This variance in ability necessitates a compiled rating for organization A as it simultaneously prepares for an innovative solution, implements a system/process, and continually improves its performance. Note: the Point of Adoption model is also discussed (along with the UK BIM Maturity model) in Episode 22 on BIM ThinkSpace. The Point of Adoption (PoA) is not to be confused with the critical mass ‘inflection point’ on the S-curve (E. M. Rogers, 1995) (Everett M Rogers, Medina, Rivera, & Wiley, 2005); or with the ‘tipping pint’, the critical threshold introduced by Gladwell (2001). The X-axis in Figure 1 represents time relative to each PoA, not as an absolute scale. That is, this version of the chart does not represent a snapshot view of compiled capability/maturity at a specific point in (absolute) time. The Relevance Metric is primarily used to compare the relevance (impact, currency and authority) of one entity relative to another, or relative to a specific stakeholder group. For example the Noteworthy BIM Publication Relevance Index (NBP-RI) compares the relevance of an NBP relative to other NBPs within and across markets. It can be also used to establish the relevance of an NBP to a group of practitioners, policy makers or researchers at a specific organizational scale - e.g. the relevance of NBIMS-US to contractors in the US (OrgScale 2), or relevance of PAS1192-4 to facility owners worldwide (OrgScale1). Please note that the NBP-RI applies to all types of noteworthy publications. However, academic articles and scientific papers typically resort to more specialised metrics for establishing topical relevance and publications' overall impact. The components are measured individually and collectively using the BIM Maturity Index (BIMMI) which includes 5 levels: (a) initial/ad-hoc, (b) defined, (c) managed, (d) integrated, and (e) optimised. Note: the Macro Maturity Components model is discussed in BIM ThinkSpace Episode 22 (published Jan 27, 2015). Note 1: the Macro Maturity Components model was first introduced as "BIM Implementation Components at Defined Market Scale v0.1" at the “8th IBS Roundtable: Mechanisation through Building Information Modelling (BIM), November 2011 – Malaysia”. Click here to view the superseded model. Note 2: the current version benefited from the excellent feedback and model validation efforts of Dr Mohamad Kassem of Teesside University (UK). 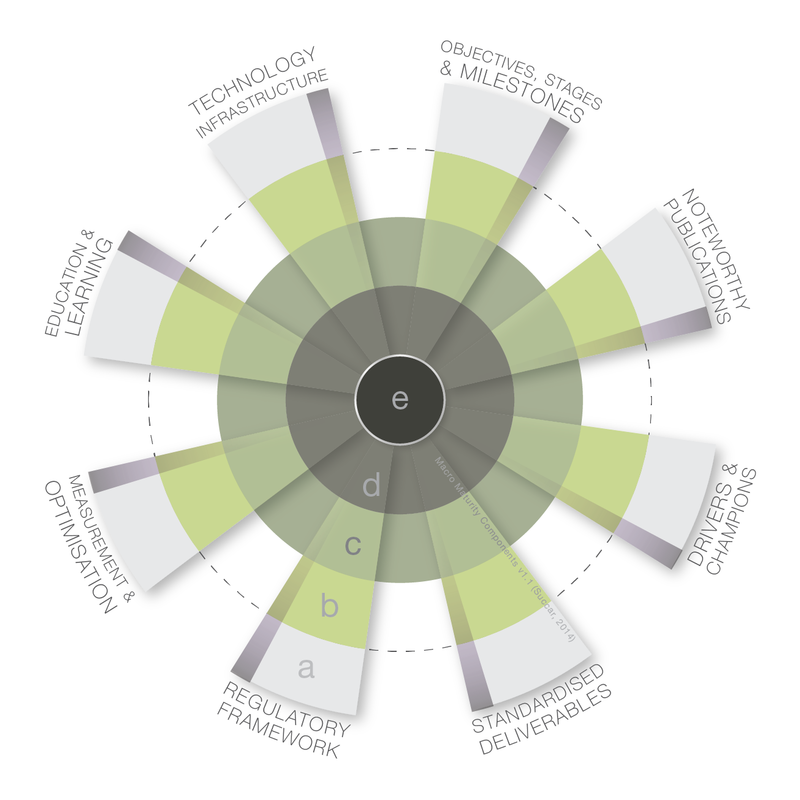 The progression from lower to higher levels of BIM Maturity indicates (i) better control through minimizing variations between targets and actual results, (ii) better predictability and forecasting by lowering variability in competency, performance and costs and (iii) greater effectiveness in reaching defined goals and setting new more ambitious ones. 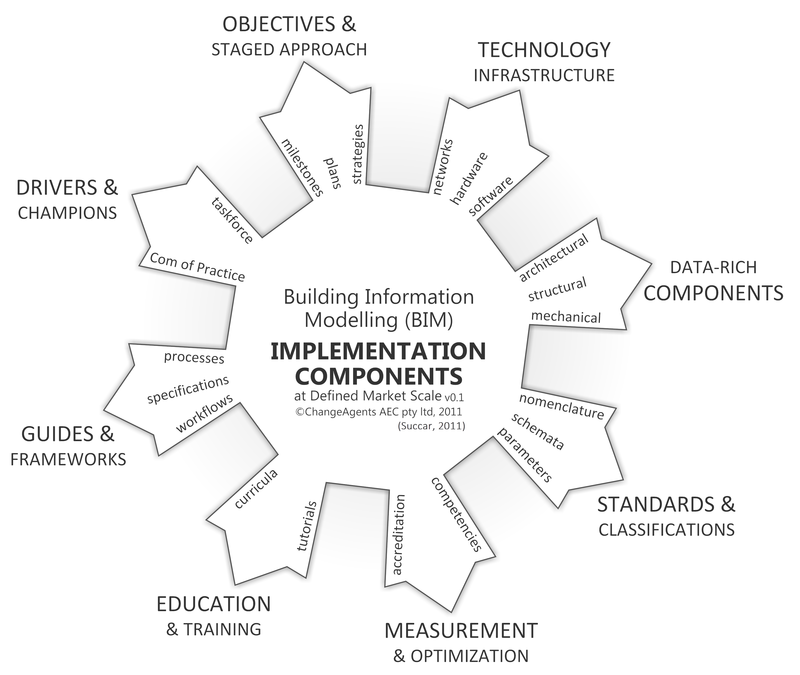 BIMMI apply to BIM Stages and BIM Steps at organizational or larger scales (e.g. Disciplines, Industries and Markets). The BIM Framework introduces the stages separating Pre-BIM (the status before BIM) from viDCO (virtually integrated Design, Construction and Operation) - the ultimate vision from implementing BIM. These revolutionary stages, and the evolutionary steps separating them, are intended to both clarify and measure BIM adoption. Note 2: The ‘BIM Stages’ model was first introduced by the author through BIM ThinkSpace (Episode 8 – Feb 18, 2008) and then published in Paper A2 as ‘BIM Maturity Stages’. As of Paper A3, the BIM capability/maturity concept embedded in the original model was split into two metrics/models: BIM Capability Stages and BIM Maturity Levels.